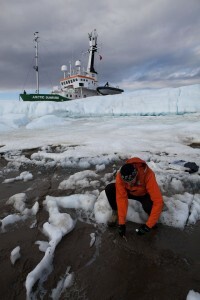 Ohio State University scientist Jason Box gathers samples of cryocronite (impurities on the ice’s surface) for analysis from the Petermann glacier in Greenland. Photo: courtesy of Jason Box. A Midland, Mich.-based graphic artist and climate change awareness advocate has turned his sights abroad to help bring attention to an environmental issue that spans the globe. Peter Sinclair, known for his YouTube video series, “Climate Denial Crock of the Week,” has become involved in Dark Snow, a research project examining the link between the wildfires of the American West with Greenland’s increasing snow melt. It is one of the first research projects to be supported through crowdfunding, a process of collecting donations of varying sizes from many individuals via the Internet. Increased melting in Greenland has been linked to a rate of sea level rise that has doubled since 2006, according to information on Dark Snow’s website. Jason Box, a scientist with Ohio State University’s Byrd Polar Research Center and Dark Snow’s leader, approached Sinclair to create videos to help raise funds for the project. Prominent environmental activist Bill McKibben endorsed the project and wrote a feature on it for Rolling Stone Magazine in August. 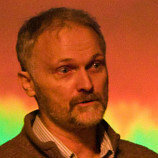 McKibben is expected to join the project team for fieldwork this summer. Sinclair has produced two videos for the project thus far, the first launched in January and the second in February. The Dark Snow project began when Box published a paper last spring describing the steady darkening of the Greenland ice sheet over the last decade, Sinclair said. Sinclair uses his videography skills to foster awareness of the Dark Snow project. Photo: courtesy of Peter Sinclair. there was a link between the unprecedented quantities of ash being released into the atmosphere and the increasing rate of snow melt in Greenland, according to Sinclair. Box theorizes that if soot and ash are carried through the air from the wildfires to the snow sheets of Greenland, it would darken the snow, decreasing its reflectivity and increase both its melting rate and that of the snow beneath it. McKenzie Skiles, a Dark Snow researcher and doctoral candidate with the University of California, Los Angeles, has studied similar issues in Colorado. That is where mineral dust from the Colorado River Basin has settled onto mountain snow deposits, increasing their absorption of sunlight. “This process advances melt, shifts runoff timing and intensity, and reduces total water yield,” Skiles said. These dark particles are a major factor in global climate changes, according to Skiles. Snow is one of the most reflective natural surfaces on the planet, reflecting up to 90 percent of incoming solar radiation, according to Skiles. As the areas of the earth covered in snow shrink, the planet will absorb more solar radiation, increasing the rate of planetary warming. While much of the ash that ends up in snowy regions comes from human sources like cars and industry, large quantities of it also come from forest fires, Skiles said. While sea level rise is one of the primary concerns related to Greenland’s melting, it should not affect the Great Lakes directly because the oceans don’t run into the lakes. Sea level rise is merely one of the most noticeable symptoms of the climate changes Dark Snow will investigate, Sinclair said. Since 2007, after a major collapse in arctic sea ice, researchers noticed weather change patterns in the northern hemisphere, said Sinclair. “There is an emerging consensus, though it’s not settled science yet, that with this rapid opening of water in the arctic that was formerly just ice, comes increasing impacts on Greenland and moreover changes in the jet stream,” he said. There is speculation that this could lead to disruptions in weather surrounding the Great Lakes region. 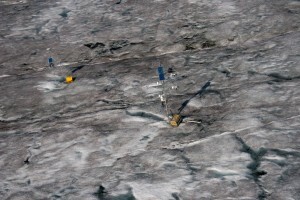 Some of Box’s research equipment studying the ice’s surface on a previous trip to Greenland. Photo: Jason Box. The opening of seas in the Arctic, melting in Greenland and weather changes in the northern hemisphere are all connected, according to Sinclair and his colleagues. Climate change is complicated and not bound by geography, Skiles said. The project’s team plans to analyze ice core samples to see if last year’s dramatic increase in snow melt is linked to the increase in wildfire activity. Dark Snow has raised more than $74,500, 48 percent of its target goal of $150,000. Sinclair said he will likely produce another video to raise awareness of the project. “We want to keep people who are interested in citizen science and climate science updated, bringing them more into the process and making it less abstract and more real,” he said.